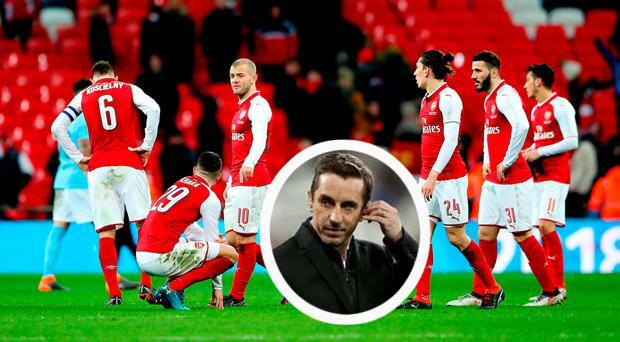 Gary Neville served up a withering attack on Arsenal after their comprehensive 3-0 defeat against Manchester City in the Carabao Cup final at Wembley. Some woeful defending contributed to another major setback for Arsene Wenger's side, with Neville unforgiving as he offered a verdict on Arsenal, with Arraon Ramsey, Mesut Ozil and Granit Xhaka coming in for especially stinging criticism. "Ramsey. Xhaka. Ozil. You're walking on a football pitch at Wembley. Why are you walking? You're a disgrace. An absolute disgrace," declared Sky Sports pundit Neville. "I don’t even want to talk about them because they’ve been an absolute disgrace. Ramsey and Xhaka walking on a football pitch. Absolutely spineless. "I have to say, I'm struggling to come up with words now to describe this Arsenal pattern, this engrained, embedded pattern that we've seen. "I've not really liked their defending for a long time, I've not really liked their leadership, the character, and the spirit on the pitch, but you've always liked the football - I don't even like the football anymore. The last bastion has gone. Liverpool play better, Tottenham play better - there's three or four teams that play better football than them now. "This is a dark, dark day - the team have just not shown up. It's not easy to win a cup final this easily, but that's what City did. "Look at the Man City players sprinting back while the Arsenal players walk back. A complete difference in mentality. Arsenal have been absolutely pathetic." Meanwhile, Arsenal legend Thierry Henry suggested Arsenal were well beaten, as he offered up few excuses for Wenger and his players. "The way Arsenal came out of the dressing room for the second half, they did not look like a team ready to come back into the game," stated Henry. "The first two goals were avoidable and they found themselves 2-0 down without City having to do much. Then they scored their third goal. "Was it one of the best performances from City this year? No, but they won a final easily." Henry went on to confirmed he 'would be interested' in succeeding Wenger as Arsenal manager, but he admitted were was not actively trying to secure the role. "Interested yes, but I couldn't talk about that, with my job at Belgium. But who wouldn't be interested in a job like that," added Arsenal's all-time record goal scorer. Never thought I could ever say this... I’ve enjoyed watching the @CPFC vs @SpursOfficial game and the @ManUtd vs @ChelseaFC more than the @Arsenal game.. @piersmorgan will probably agree... #Gutted..